Some say that 80% of your success is just showing up. I don’t necessarily believe that. Anybody can ‘show up’. A lot of your success is not just showing up but it’s also being ready, being prepared, and starting the day thinking that you’re going to own it. It’s about being present, and being better. Start the day with a good attitude – The attitude that you’re going to own the day. Everybody has the ability to be good, but how many of us have the ability to be better than good? 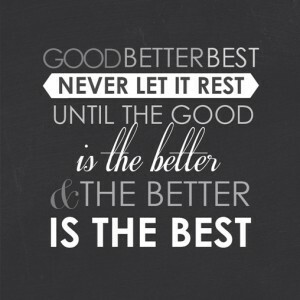 What does it take to be better than good? It takes a little bit of heart and a little bit of intensity to go from being good to better; and then from being better to being your best. Be your best every day. No excuses. It’s easy to make excuses. It’s easy to blame it on circumstances and blame it on our friends, parents, coaches or teachers. Your best is arriving every day being focused, being ready, and not making excuses. Your best is having some motivation, having some heart, being kind, and being charismatic. Be the best you that you can be every day, and you don’t have a lot to worry about. Be your best. Not someone else’s best, but your best. No excuses. What do you do every day to be your best? Share with me in the comments below.